One of the keys to insuring a proper reflow cycle is getting to and maintaining the proper preheat temperature. This is accomplished with a PCB preheater which heats the board to between 75 and 125º C prior to the application of heat to the part area requiring rework. This part of the rework process is a critical component as done properly it minimizes PCB warpage during component removal while at the same time limiting the thermal shock to the PCB. The maximum temperature is determined by the thermal expansion of the PCB. In order to maintain the integrity of the PCB laminate the maximum preheat temperature is set approximately 10ºC or below the Tg (glass transition temperature) of the PCB material. Higher thermal preheat temperatures minimize the potential thermal distortion and shock to the PCB during the reflow process. BGAs should be handled in ESD safe work areas in order to prevent damage to sensitive components from electrostatic discharges. These areas must be designed and maintained to prevent ESD damage. PCBs should be handled at properly designated work areas only. Designated work areas must be kept free of static generating materials such as Styrofoam, vinyl, plastic, fabrics or any other static generating materials. Work areas must be kept clean and neat in order to prevent contamination of the work area. Circuit board assemblies should be handled by the edges. Avoid touching the circuits or components. 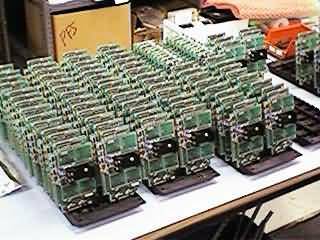 Stacking of circuit boards and assemblies should be avoided to prevent physical damage. Special racks and trays are provided for handling. All moisture sensitive devices should be handled as per IPC/JEDEC J-STD-020A and IPC JEDEC J-STD-033 standards. Areas near the area array device being reworked require their temperature to be controlled and limited to less than 150ºC or to the manufacturer's specifications paying special attention to "heat sensitive" devices such as connectors, plastic housing or similar lower melt temperature components. Heat shielding may be required in some cases to prevent temperature extremes from being developed.